Pope Francis said the archives would be opened in March next year, adding that Pius's legacy had been treated with "some prejudice and exaggeration". He said it included "moments of grave difficulties, tormented decisions of human and Christian prudence, that to some could appear as reticence". The prefect of the Vatican's Secret Archive said the opening would allow a more profound evaluation of a figure who had been subject to what he called "superficial criticism". "The Church is not afraid of history," the Pope told a meeting of Vatican researchers. The pontiff's decision to open up the Vatican's secret archives on Pope Pius XII may be his attempt to end decades of debate about his predecessor's role in World War Two - and to prove that today's Church is not suppressing argument. Preparing the archives for scrutiny has been a lengthy process. For the past 13 years, 20 members of the Vatican's archives department have worked to organise Pius XII's files, including his official correspondence. Researchers will now have the chance to sift through an estimated 16 million pages of documents. What Jewish reaction has there been? The Yad Vashem Holocaust memorial commended the decision and expressed expectation that "researchers will be granted full access to all the documents stored in the archives". The American Jewish Committee (AJC) said it had called for this move for over 30 years. "It is particularly important that experts from the leading Holocaust memorial institutes in Israel and the US objectively evaluate as best as possible the historical record of that most terrible of times, to acknowledge both the failures as well as the valiant efforts made during the period of the Shoah [Holocaust]," said Rabbi David Rosen, the AJC's International Director of Interreligious Affairs. Israel's foreign ministry also expressed hopes that there would be "free access to all relevant archives". How much access has been allowed previously? Vatican archivists had already started preparing the documents for consultation back in 2006, at the request of Benedict XVI. That year, the Vatican opened its archives to allow historians to access documents from 1922 to 1939. But at the time, key records potentially contained in the archive remained closed despite requests from rabbis and Jewish historians when Pope Benedict XVI was elected in 2005. Historians have sought greater access to the Vatican's secret archives to clarify the role of the Church in the run-up to World War Two. The archives contain records of all Papal decrees, encyclicals and Vatican diplomatic correspondence. Cardinal Eugenio Pacelli was pontiff from 1939 to 1958 and although the Vatican has begun his beatification process he has not been canonised. His actions will be scrutinised as part of current efforts to decide whether he should be declared a saint. He has been criticised by Jewish groups for not speaking out against the Nazis, who killed six million Jews. He did not sign an Allied declaration in December 1942 condemning the Nazi extermination of Jews and did not protest publicly at the deportations from Rome to Auschwitz. But in 2014 Pope Francis said Pius XII was "a great defender of Jews" and had ordered the Church to hide Jews in the convents of Rome and other Italian cities, as well as the papal residence at Castel Gandolfo. "One needs to see his role in the context of the time," he said. "For example, was it better for him not to speak so that more Jews would not be killed or for him to speak?" Yad Vashem, the Holocaust memorial in Jerusalem, updated its text on Pius and the Vatican in 2012 to reflect more recent research on the wartime Pope. 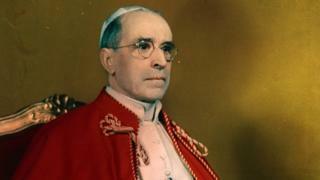 Pius XII's reaction to the Holocaust "is a matter of controversy among scholars", it said, and until all material was made available, the topic would remain open to further inquiry.